Late in 2016 Tom Cannavan spent 10 days touring several of Australia’s most important wine regions for this report. It will be published in five parts. Just an easy 40-minute drive south of Adelaide brings you to the small town of McLaren Vale, centre of an Australian wine region synonymous with Rhône, and to an extent, Italian varieties. This is South Australia, the hub of the Australian wine industry, boasting a plethora of vineyard regions of world renown. My last visit here was to judge at the McLaren Vale Wine Show, an immersive week in the region, but that was seven years ago and as with the rest of Australia, much has changed. 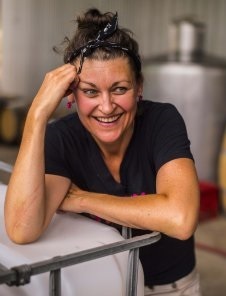 My first visit was to the Gemtree Estate, bought as a dairy farm in 1994 by the Buttery family, daughter Melissa is the viticulturist whilst husband Mike Brown is chief winemaker. The family realised that a large part of the property wasn’t needed for vines, so started a native tree planting programme which has developed into a major wetlands project, with 45,000 trees planted, to become a major attraction in the area. 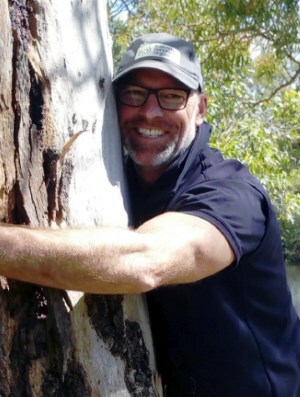 “It has encouraged amazing biodiversity,” says Mike, left, as I playfully suggest he hugs one of the trees. That’s a joke about his and Melissa’s dedication to environmental causes that extends to the vineyards, which have been farmed organically since 2000 and are now certified as organic and biodynamic. Mike also helps steer a sustainable wine programme for the whole region, not necessarily organic, but as he says “in an essentially hot and dry region there is just no need for high intervention use of herbacides and treatments.” To that end 27% of the entire region’s vineyards are now certified organic. (2017) A cool, creamy nose with some green-flecked character, a bit of lanolin richness. the palate is bone dry, with a little creamy character and a juicy citrus and apple. Successful. (2017) Made from Tempranillo. There's a creaminess again, a touch of tobacco and gentle sweet and nutty spice, a soft strawberries and cream fruit. The palate is gentle and easy drinking, with a bit more spice and firming acidity. (2017) 40% Grenache, 33% Shiraz and 27% Mourvedre. A dry, lightly leathery and gravelly character with small redcurrant and black fruit dryness. The palate has a fine, racy profile, spices and crunchy acid against quite sweet, but agile and savoury fruit. Drinks easily but well. (2017) Much bigger, creamier and more chocolaty than the GSM, with coffee and spice richness and forward character. Deliciously creamy, certainly adding texture and creamy oak richness. Lovely, straightforward but delicious. (2017) 54% Mourvedre with Cabernet Sauvignon, Grenache and Shiraz. Big spicy nose, plenty of lift and charcoal, sweet fat currants and blackberry. Loads of lift. The palate has so much sweet fruit, curranty and intense, but lively freshness again, with plenty of juiciness and spice. (2017) A more leathery character, cedar and graphite and a solidly plummy fruit. A more concentrated style with spices and fleshiness. The palate has a surging sweetness, with chocolate, cigar smoke and cream, silky tannins and juicy cherry skin bittersweet acidity. (2017) A similar leather and cedar nose. Subtle violet notes, real dark blue-black fruit touching on damson-skin and blueberry, but still that little floral lift. There's a brighter fruit and acid character compared to the Ernest Allan, fresh, still with a touch of cocoa and sweet ripeness, but a little more energy. Coriole’s vineyards surround the original 1860 farmhouse and extensive visitor facilities, making it one of the most beautiful – and most popular – in McLaren Vale (see below). Coriole is famous for its Italianate leanings. Though Shiraz has been a focus since the Lloyd family set up shop in 1967 (and still makes up 65% of all plantings), by 1985 they had planted Sangiovese on these terra rosa soils over limestone, to be followed by Fiano, Barbera and Montepulciano amongst others. Here I would meet up with a whole bunch of local producers to taste extensively. Other notes in this section come from a wonderful producers’ dinner at the legendary Star of Greece seafood restaurant on the coastal cliffs at Port Willunga. (2017) Pretty pear and ripe apple fruit, youthful and a little bit tanky. Bone dry and very pithy. (2017) A lot of perfume here, a touch of flowers and straw, a little volatile lift. The palate dry and perhaps needs a little more fruit, but good. (2017) A pretty nose, some flowers and very crunchy apple fruit, the acidity is pretty pithy and dry, but has plenty of lemon and orange brightness. (2017) Lots of lemon zestiness to this, some fruit skins and phenolic character, a lot of brightness, crisp under-ripe pear and apple. A lean and fresh style. Only 11.8 abv and certainly no sign of flabbiness or heat. (2017) Fine, lifted fragrance with a touch of bloodiness and cedar/graphite. The palate has delicious sweetness, a lot of juicy blackcurrant, a fine acid balance. (2017) A little less fragrant, but a lovely solid and deliciously plummy and chocolate black fruit. A solid wine, but balanced. (2017) Still labelled as 'The Angelus' in Australia, it's a homage to the famous wine of St Emilion. Made in all French oak, 30% new. From cooler sites in Mclaren Vale and a selection of the best vineyards. Big cassis fruit, a lovely dustiness and sense of plushness, but elegant in the finish and accurate. (2017) High vineyards, planted on clay, dry grown. Sweet vanilla and a hint of menthol, the palate becoming very juicy, a natural feeling acidity and a lovely crispness to the acids. Savoury on the finish. (2017) Made in open fermenters and aged in French oak. A nice spiciness and Morello cherry, with a lovely smoky and pencil shaving quality, taut black fruit coming through. Lovely ripeness and creamy, juicy black fruit into an elegant and quite lifted perfume on the finish. 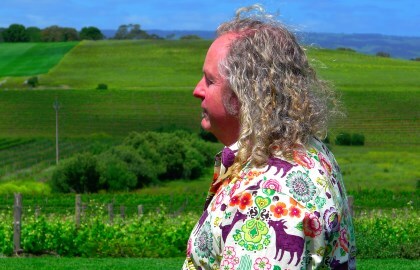 (2017) d'Arenberg is the largest biodynamic grower in Australia. From a nearly extinct clone, a parent of the Reynella clone. Very low yields. Foot-trodden. Very fragrant with a touch of leafiness and really tight, fresh black fruit, lovely tobacco and a deeper cocoa and mulberry plushness. Great balance, plenty of tannin but tight and fine into a long finish. Note price and stockist quoted at time of review are for the 2011 vintage. (2017) Made in an Amarone style, from 45-year-old vines, the grapes dried for 6 to 7 weeks. Smoky, tight, blue-black fruit with an intensity and a touch of prune, but absolutely not stewed, it's the ripe juiciness that comes through. Tight and black into the finish. (2017) Dusty with a little dry, slightly green aspect, lots of lift and bright freshness too. The palate tight and pure, a really fresh and taut finish in an elegant and restrained style. (2017) Subtle graphite and pencil shaving fragrance to taut, glossy and ripe black fruit, a touch of cocoa but really the cherry freshness defines this, the savoury aspect is delicious and again a natural freshness. (2017) Much darker, sweeter, plummier than the Battle of Bosworth, with a richness and sweetness, but still has the more perfumed, more elegant character. There's a medium bodied elegance on the palate too - fresh again, more gloss, but a similar brightness. (2017) From a vineyard that once went into Grange. Hugely lifted nose, so dusty. Such an intense liquorice and Parma violet-touched character, very pure. Gorgeous sweet fruit, a touch of chocolate and creaminess of high quality French oak. Delicious and very long, smooth and balanced for ageing. (2017) Smooth chocolate-rich nose, but there's a Sandalwood exoticism, and sweet black fruit intensity and richness. The palate has a lovely natural concentration and feeling of black fruit purity. (2017) Tight, chocolaty plush, a weight of blue/black fruit on the nose and then a flood of the same on the palate: depths of fruit but such elegance too with a balanced finish. From the organic and biodynamic Warboys Vineyard planted in 1948. (2017) Sweet, rich hugely dusty but a graphite and tobacco sheen and hint of green olive character that's lovely. For me, a beautifully pitched and defined Shiraz. (2017) Creamy fudge like ripe fruit richness, with lots of sophisticated graphite and pencil shaving, a nice blend of plump, red, plummy fruit and tighter blackcurrant. Lovely length. Spicy. (2017) So much more meaty and meat stocky that many of these McLaren Vale Shiraz', blood and liquorice, with an old polished wood quality. juicy and tight tannins, delicious lightness against the concentration with a real freshness to the rich, dry, savoury finish. (2017) Pure, smoky and fragrant with exotic Sandalwood and spice. From the Haselgrove stable, it has lovely mocha notes with such sweet fruit, delicious spice and exoticism, but keeps that rose scented fragrance into a tight, supple finish. (2017) Obvious age with a touch of dustiness and a little savoury slightly oxidative note. That touch of oxidation gives a fine meat stock and iodine character that's bloody and firm over the deep, dark and savoury fruit. The tannins now sweet and juicy. (2017) Nero d'Avola made in amphorae, and from organically grown grapes, with six months on the skins. Really nice sweet fruit, with a ripe blueberry dark sweetness. very smooth tannins, staying bright and focused, with a tight juiciness that's beautifully tapered. (2017) Chocolate and coffee, lots of clove and cinnamon spice of American oak. the Shiraz is ripe and black plummy, a really big chocolaty palate but the Sangiovese does add a cherry brightness. A plush and beautifully bold and welcoming style. (2017) Delightful herbal and lightly earthy nose, with a sappy and supple fruit, a little nuttiness and that fine dry cherry fruit. Some light and shade to this, the oak adding some spice and vanilla towards the finish, and deliciously gluggable. Next stop was the d’Arenberg winery, one of McLaren Vale’s most famous names, with two of its most famous figureheads: Chester Osborne (right) and his legendary dad, d’Arry, now 90 years old but there to greet me and pay very close attention all through the subsequent tasting. d’Arenberg is also nearing the end of construction of its new visitor facility known widely as ‘The Cube’. The architects have designed it as a giant Rubik’s Cube, the centre layer at 45° to the top and bottom layers. It’s a grandiose project, but then Chester is full of those. (2017) A longer growing period, slightly lower alcohol and slightly higher acidity than normal. A blend of 44%, Grenache, 33% Syrah, 23% Mourvedre. Has plenty of chestnutty, gently meaty character with a plummy black fruit and touch of exotic almost peachy character. Moves into a sweeter fruit profile on the palate, with a nice stripe of red liquorice brightness and spices into the pretty, elegant finish. (2017) A hotter, bigger vintage. Much creamier and with a fatter black fruit but still a little ashy and smoky lift, that touch of meatiness. The palate again so sweet, plush, the tannins tight, structured and fresh acidity makes it very easy to drink, but firm at the core. A touch of that floral character on the nose also appears in the finish. (2017) 61% Grenache from Blewitt Springs sandy soils that usefully make the vine struggle a little, around 30% Shiraz and 10% Mourvedre. Lovely bright red fruit opening, with a touch of herb and floral lift, very fresh and appealing, with hint of nutty Grenache dryness. On the palate really dry, a nice herbal streak to the small dry red fruits. (2017) Almost all Grenache, just a splash of Shiraz "to tempt the naysayers." Bright, a touch of schisty, characoally, watercolour paintbox dry lift, some spice too with a well-tempered palate, riven with a lemony acidity, a very fine and long line to the palate, with the lightest palate of the four so far, easy on the finish. (2017) Lovely pale colour still, with nutty, spicy, savoury red and black berries. The palate has a silky texture and lovely medium-bodied finesse, that touch of nuttiness and dry, fine tannins with juicy and fresh acidity. (2017) Certainly a broader fruit character, more weight than the Wirra Wirra, with great juiciness, a nice cherry lift of brightness, fine tannins - very dry - with the freshness and nutty flavours balanced by good acidity. (2017) Really lifted perfume here, lots of florals and tobacco spices, a bold blackberry fruit but hints of juicy red berries too. Creamy and sweet on the palate, a real flood of sweet fruit and a certain fleshiness, a touch of coffee from quality oak adding more smooth tannin to the finish. Note stockist and price quoted at time of review is for the 2013 vintage. (2017) A lovely perfume with touches of nuttiness and violet and cherry, and also a little bit of dried cherry or Chinese dried plum. Dry and savoury and with a lean stripe of tannin and acidity, quite grippy, but some of that floral charm stays to the finish. (2017) Made from old bush vine, from once overgrown and abandoned vineyards as Grenache fell out of favour. Older French and American oak just adds a touch of spice and earthiness, but its all about buoyant fruit, grape spice and a long finish that stays juicy, taut and very moreish. Two famous Riesling terroirs, the Clare and Eden Valleys, both lie in South Australia. I suspect that many consumers make no clear distinction between the two, and yet in many respects they are quite different. As can be seen in the map, Eden Valley is basically a sub-zone of the Barossa, lying around one hour’s driving south of Clare. Temperatures here are 2ºC to 3ºC cooler on average, but both enjoy cool nights and long hang-times allowing grapes to ripen slowly. Those cool nights are thanks to elevation, because both regions are not ‘valleys’ at all, but elevated plateaus and hilly terrains, where the prime vineyards lie at or around 500 to 600 metres above sea level. That is vital in making these such excellent Riesling terroirs, the variety having long ago given way to Chardonnay and other varieties in hotter parts of the country. Both are ‘cool’ by Australian standards (if not by German or Austrian). Sited 130 kilometres north of Adelaide, the vineyards of the Clare Valley lie at between 400 and 600 metres altitude. Soils vary greatly, the most famous appellation, Polish Hill, is on slate (as is much of the eastern side of the Valley), whilst Watervale is on limestone. Clare wines retain lots of nervous energy and tension, but can be a little more exuberant than those from Eden Valley, some displaying tropical fruit notes. In the south-east corner of Barossa, further from the moderating influence of the ocean, Eden Valley wines tend to be a little more restrained, edged with citrus and floral character, but also a chalky mineral quality. Wines from both regions can age remarkably well, developing honey, toast, sometimes paraffin aromas, and seeming to gain a little weight and texture over the years. I was hosted at a comparative tasting and food-matching dinner by the winemakers of Clare and Eden Valleys, represented by ‘KT’ (right) the eponymous Kerri Thompson of Wines By KT in the Clare Valley, and Helen McCarthy (below), winemaker at Mountadam Vineyards of Eden Valley. The chance to compare each region side by side did, generally, prove that the distinctions listed above do exist, but also demonstrated that specific terroirs within each region, and of course specific approaches taken by winemakers, can blur the boundaries of these superb, thrilling Riesling wines. The food matching spanned everything from caramelised pork belly (matched to mature wines) to roasted barramundi with slightly younger wines, showing real versatility. 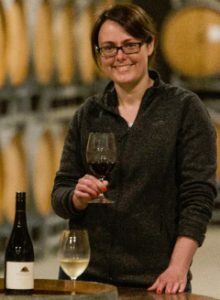 (2017) The family has been making wine in the Clare for 30 years. There's a firm green character to this single vineyard wine, with a suggestion of phenolic melon skins and lime rind, the palate delivering a shock of dry grapefruit pith acidity, a slightly fatter lime character coming through, but that chalky dry acidity punches through. Should mature nicely. (2017) A slightly more floral and more elegant character on the nose than the Pikes, a touch of exotic fruit and waxiness. The palate has a real intensity, lemon and lime streaking through, a bit of wet pebble mineral character. Prettier than the Pikes. (2017) Owned and operated by the Baker family, sourced mainly from the western side of the valley, easterly facing and does not get quite so much sun. Less aromatic than the Rieslingfreak No 3, some delicate white currant notes, a touch of white flowers and the palate has a slightly less strident acidity. Price and stockist quoted at time of review is for the 2014 vintage. (2017) From a 1973 vineyard, still worked by owners who are in their 80s. Quite a phenolic character, melon rind and light waxiness, with a touch of green, but streaking with juicy acidity, sharp apple and citrus fruit, but a little bit of bright lemony character too. For the future. (2017) A family-owned estate produces this limey and quite elegant and fragrant wine, with floral notes and a waxy lemon rind nuance. It has a slightly more chalky acid character than the Clare wines, not as aggressive/austere as some of them in their youth, remaining juicy and limey. (2017) From a vineyard planted in 1968 this is quite stony on the nose, lean and not hugely expressive. The palate is dry and lemon juicy, clean and delicate, perhaps lacks a bit of fireworks compared to some. I would say this very young and tight Riesling possibly has more to give in the future. (2017) A blend of fruit from a 1960s dry-grown vineyard and a 1990s vineyard. A bit of richness here, a bit of smoky minerals, with again a mineral chalkiness to the acidity, a bit of more vivacious grapefruit and lime fruit. (2017) Quite a nutty and natural feel, with a hint of star fruit or Sharon fruit-skin phenolics and a real juiciness that pushes through. Becomes quite sparky and intense. (2017) Ripe, smoky and deeply waxy, a very pungently fragrant Riesling, with a beautifully clear and elegant palate, the acidity now a crystal clear and imbued with a sense of elegant freshness. Less aromatic than the Pauletts for example, but with a very direct lemony intensity but does add extra rigour in place of the Pauletts' luscious ripeness. (2017) Very fresh and zippy, with a touch of really nice beeswax but love the freshness and zip, and the acid so beautifully integrated already. (2017) Glowing golden colour, developing toasty, honeyed aromas, but that sense of fat and generosity is still cut by terrific apple juiciness and streaking lime and salt acidity. Note price and stockist given at time of review is for the 2009 vintage. (2017) A little bit funky and reduced at first that blows off to reveal more floral characters and lemon rind a touch of nettle herbs. The palate cool and beautifully elegant, the acid already integrated, fat orangy and honey element, zesty and pure into a long finish. (2017) Creamy and waxy, a delicious bright apple purity and streak of lime. A lovely midway point between the shimmering acid brightness of youth and the butter and wax development. long and minty into the finish. (2017) This too has a quite similar wax with a bit more butter and even a hint of mint humbug, an elegant palate, perhaps slightly less intense, just a touch softer, but lovely. Price and stockist quoted at time of review is for the 2008 vintage. (2017) Quite a deep colour, the most fragrant floral and jasmine edges to that buttery wax development. The palate has great richness, but shot through with pure shimmering mineral acidity. Delightful. Good stuff Tom. Going to Australia is an annual – and necessary – pilgrimage for us and we spend most of our time around Adelaide, so the features on Barossa, Clare, Adelaide Hills and especially McLaren Vale brought back happy memories of our many visits to the vineyards there. Coriole and D’Arenberg are places we have returned to – and we were treated to a lovely lunch at the Star of Greece for our 40th anniversary a few years ago – it was good to hear you enjoyed it too. Great stuff Ian, so glad this could invoke many happy memories. A bottle of McLaren Vale Shiraz (or Grenache) in the fridge for the weekend maybe?